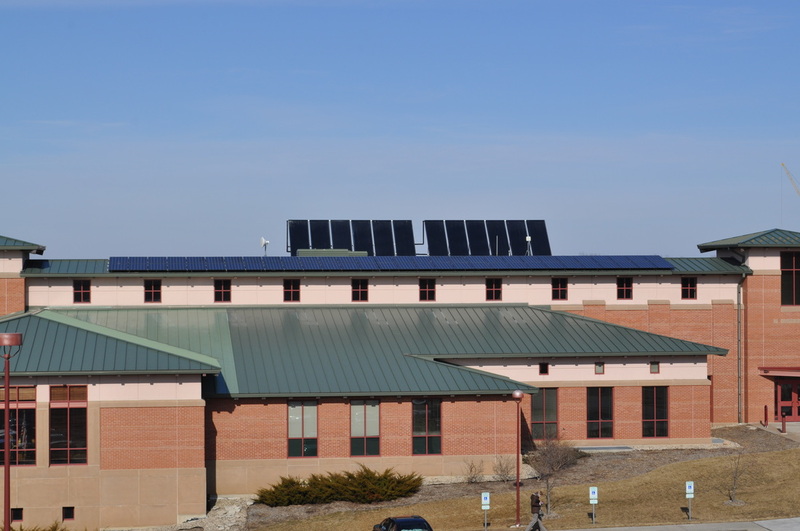 Twelve 4’x10’ solar thermal panels and sixty 205 watt solar electric panels provide renewable energy to the Fitchburg City Hall. The array is highly visible and will produce 500-600 gallons of hot water every sunny day. The 12.3 kW solar electric system will produce over 14,000 kilowatt hours per year, enough to power two average homes. 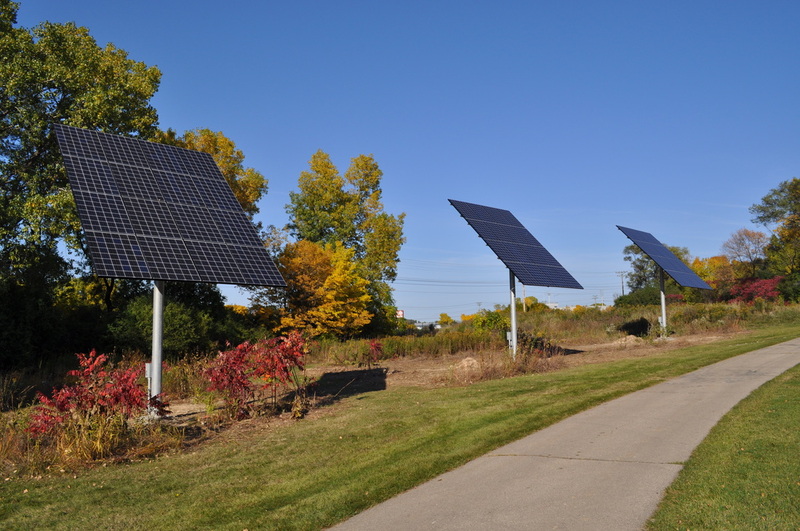 Fitchburg also installed a 10 kW ground mount system near the Municipal garage on Fish Hatchery Road. Project Description: The Fitchburg Public Library, located in Fitchburg Center, broke ground in 2010 and opened to the public on June 29, 2011. The building is slated to qualify for LEED Gold status. 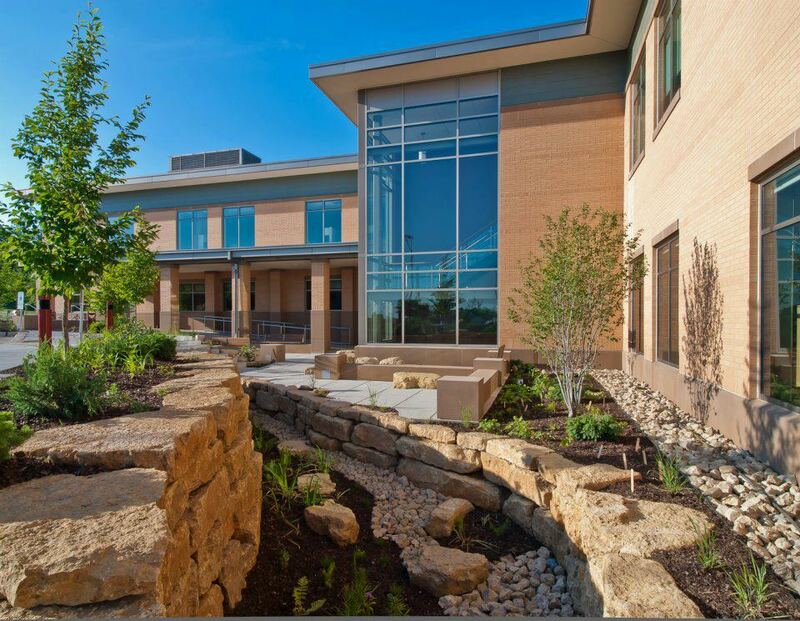 Some of the sustainable systems in the building include geothermal wells for heating and cooling, radiant floor heat, daylighting and occupancy sensors, high efficiency fixtures, drought resistant landscaping and rain gardens. The building is 38,000 square feet, offers underground parking, and has more than 3,000 visitors per week! 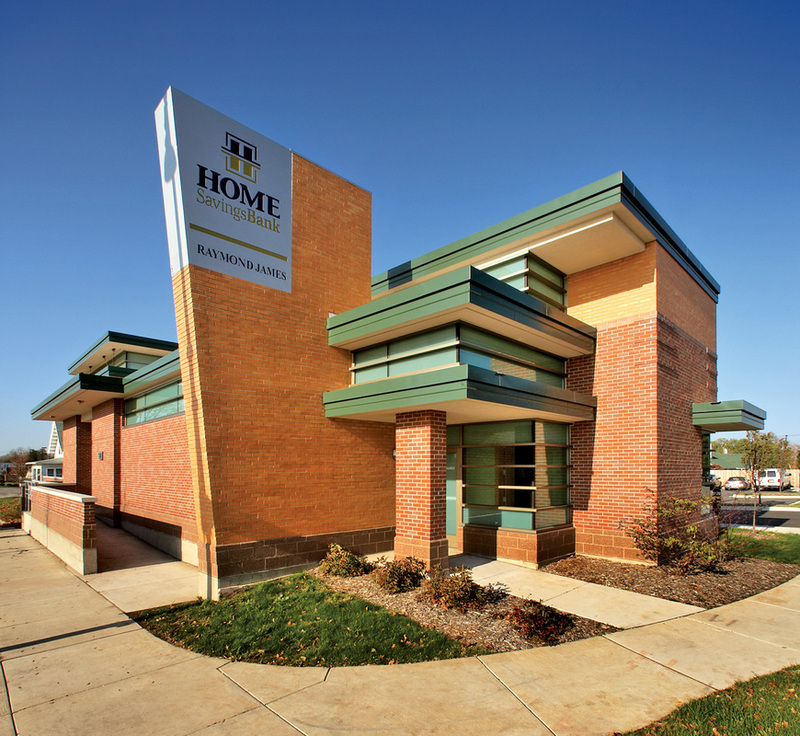 Home Savings Bank East is Wisconsin’s First LEED Silver certified bank, using innovative techniques and sustainable materials to provide a healthy, energy efficient workplace and customer environment. High ceilings and clerestory windows bring sunlight inside, and freshly filtered air is continually provided to enhance air quality. Many of the interior finishes and furnishings were sourced from within 500 miles, and have recycled content, including Dakota Burl desktops, Marmoleum countertops, and a concrete teller counter. Asphalt from the old site was ground and reused for the new parking lot, and a generous rain garden absorbs rainfall eliminating runoff to Madison’s lakes. Here is a chance to view top of pole arrays up close and personal. These 16 panel arrays, measuring 17’ wide by 13’ high are impressive and inspiring. Despite an overall height of about 20’, the arrays are largely out of sight in a corner of the American Family property. Power from the arrays feeds into an electrical service at the corporate sign located nearby. Since the inverters are located outside, this is a great opportunity to see the solar array and inverters all at one location. This installation is visible from highway 30 and highway 51. Union Cab has a 5kW solar array system installed in 2012. We recognize the dichotomy of a transportation company that relies on fossil fuels as being environmentally friendly, and believe that a solar installation helps balance our footprint. With the support of MadiSUN Solar Program, we were able to kick-start our commitment to alternative energy by installing the first-of-its-kind solar array made from components manufactured in Wisconsin. We also landscape for water absorption, capture and use rainwater through the strategic use of rainbarrels, engage in a wide variety of waste reduction through recycling, and encourage biking to work with a bike barn. 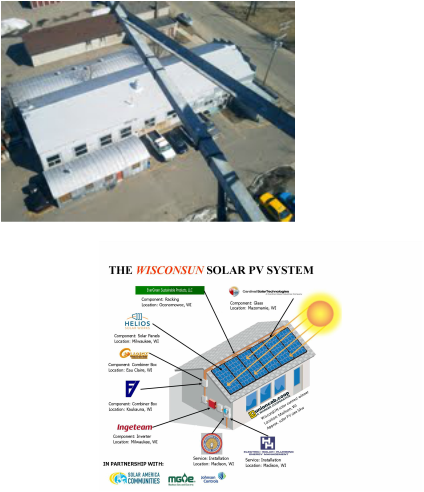 Full Spectrum Solar built our office within a large steel building that previously held an auto-body shop. The super-insulated space includes radiant in-floor heating with a high-efficiency condensing boiler (plus soon-to-be installed solar collectors). Clerestory windows provide day lighting, and there is recycled flooring and furniture. A sophisticated ventilation system monitors CO2, and also keeps the office cool during the summer by venting when the outdoor temperature becomes cooler than inside. A solar electric awning shades the south-facing windows, and another roof-mounted photovoltaic system produces more electricity than is used in the office and attached warehouse/garage.